With its high price, small screen, and meager components, the Armor X7 is far from a consumer tablet. But its rugged, closed chassis will hold up to a great amount of abuse, and its smart, twin-battery arrangement gives workers in the field a tough little tablet that'll run nearly all day. Plus, DRS Technologies backs the Armor X7 with a three-year parts-and-labor warranty, which like its rugged chassis, goes beyond what you would get with a consumer tablet. For professionals who job takes them to dangerous , diverse, or unusual computing locations, the Armor X7 is the rugged little tablet that could. Just make sure that your company's software is functional on its small, 7-inch touchscreen. Judging by the specs and pictures, the X7 represents a very valuable addition to the ARMOR line of rugged tablet computers. 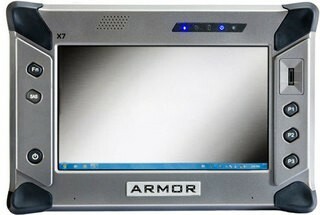 The small screen size and the lower performance level of the Atom processor platform present deployment limits, but if those limits are not an issue, then the smaller size and low weight (and presumably lower price) of the ARMOR X7 make it a perfect solution for many field applications. This latest model has significantly updated electronics that, for now, put its performance ahead of the competition. It also has more externally accessible connectivity than before while retaining its internal expansion and configuration flexibility. The machine has a superb outdoor and sunlight-viewable 10.4-inch display with perfect viewing angle from all sides, and is available with either an autosense dual-input resistive touch/electromagnetic pen panel or a single mode electromagnetic digitizer. 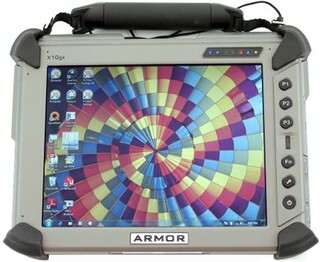 With these latest updates and improvements, the ARMOR X10gx tablet remains a top-tier tool for rugged computing jobs in fields such as utilities, public safety, construction, manufacturing, military, and other applications that require computing power in a nearly indestructible package. What the X10gx lacks in processing power, it makes up for in toughness. I can't begin to describe the sheer abuse it endured in my care. For example, the drop video took multiple takes, and that was only after I carelessly tossed the rugged tablet around the office before stuffing it in the freezer. Not only did the X10gx absorb the abuse, it showed no scuffs, scratches or scrapes. I can easily see it surviving the day-to-day of a construction site or otherdemanding environment. That said, it's not without flaws. Besides its relatively low computing power and high price, it gets very hot. It's almost painful to the touch. Also, the programmable buttons can only control screen brightness and the fingerprint scanner doesn't work out of the box. Ultimately, the X10gx is exactly what it claims to be: a rugged tablet. With its price, it is not a consumer device. But it's fit for the basic computing tasks needed in the field. And thanks to its Flexspace Compartments suitable for an RFID tracker, GPS functionality and optional WWAN antenna, an organization can fit the X10gx for life on the go. In my first impression of the ARMOR X10gx, I called the machine “fun” and I’m sticking to that. While a rugged tablet does not fit into my life, I found myself enjoying the experience of toting the ARMOR by its handle and heading on my way. No need for a protective case or pack. Just grab and go. The speedy SSD made a big impact on me, and I’m seriously looking into upgrading to one. Pricing depends on your order requirements, but rugged computers do not come cheap. DRS offers many accessories and peripherals, such as mounting and docking stations. Full details on the DRS website. That one small flaw aside, the ARMOR X10gx performed solidly for me. Tough yet fun. Visit the Armor Q&A Forum to get answers, ask a question or help others.